Whilst walking through Debenhams the other week, I walked past the Topshop concession and saw this pink pearl studded bag with a long gold metal strap. It was love at first sight! It's so gorgeous and I think it looks quite Gucci-inspired so that was enough for me! I've been wearing a lot of shorter shoulder strap bags lately and finding them annoying so I'm glad I can wear this crossbody. I think it's a bargain for just £26 as well. I can only find it available at Selfridges here at the moment, it must have been popular! The above purchase then made me have a look at the Topshop website to see what other bags they had and I saw the same one in black. I love that one too so I had to have it! This also seems to be out of stock on the website which is extremely annoying! The full name of the bag is Ruby faux-pearl pearl studded cross-body bag so it's worth keeping an eye out on the Topshop and Selfridges websites to see if it comes back in stock. I've provided the exact links so you can tell straight away if it's available or not. 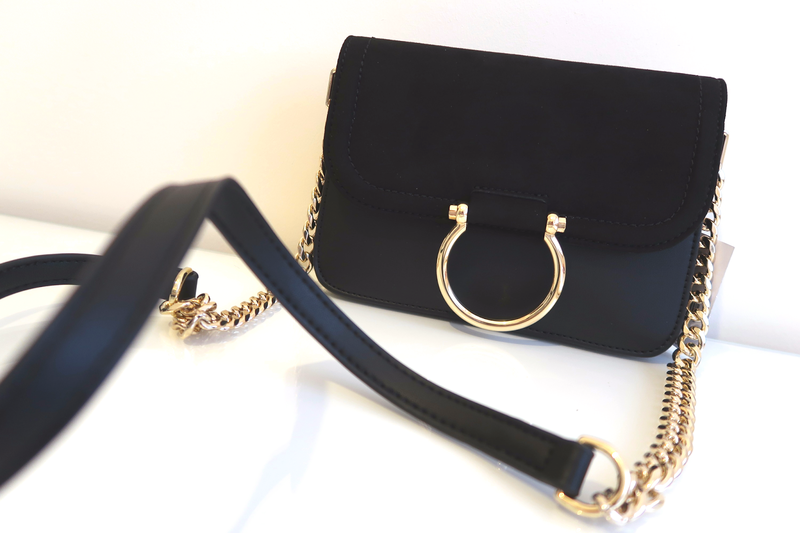 The third and final purchase is the Remy D-Ring PU Cross Body Bag in Black. This gorgeous mix of faux leather and suede with the gold ring detailing reminds me of the popular Chloe Faye bags, which are around £1000. This was just £25 and I love it. Unfortunately this one is also out of stock. These bags must have been snapped up so quickly but here's the link in case it comes back in stock again. They were also doing red and blue versions so worth watching out to see if they come back. I feel like this blog post was a bit of a letdown because the bags sold out so quickly but the point of this post was supposed to be so that I could share my designer-esque finds with you. I definitely recommend having a look in Topshop at the bags as they have so many fab ones at the moment. Definitely great if you have your eye on something like Gucci/Chloe but can't really afford it. Have you bought any amazing high street bags lately?